Today’s Grand Prix race came with a sudden twist at the end. The team I follow is McLaren and throughout the whole race they were performing really well. 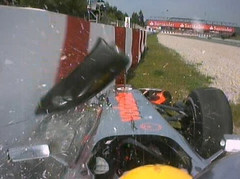 That was up until the second last lap where suddenly Lewis’ tyre blew out and he lost control and crashed the car. I could not believe it, he was set to be on the podium again, last time in China he was up there. I would be absolutely gutted if I had completed almost the entire race and was in with a good chance of winning and then suddenly have to retire due to a tyre blow out! The race was excellent though and I did not even expect Lewis to get as far as he did, I didn’t know the drivers starting positions until today as I didn’t get time to watch the qualifying laps. As soon as I saw that the two Red-Bull cars were in P1 and P2 I knew that it was going to be a good race, Webber and Vettel are great drivers and you can guarantee that if they qualify in those positions then they are likely to keep them. When Lewis suddenly overtook Vettel I couldn’t believe it, I was sure that the race was going to finish with the two red bulls in P1 and P2 and Lewis staying in P3 where he qualified. Lewis has definitely lost a lot of points now because of this race, and will have to pull of some incredible races over the next few races to attempt to get back into the battle for world champion. Button is doing brilliant so far this season, currently up on top, leading by 3 points, it’s not a lot but if he keeps up with these steady points he is going to be in with a good chance of winning world champion for the second time in two years. The next race is in Monaco next week, and this is definitely my most favourite track out of them all, it is usually full of action and the cars are in close to each other in lots of corners as they are sharp, I think what also makes these track interesting is that it takes place out on the streets! The people in the apartments around the street where the race takes place definitely have the best seats in the house!